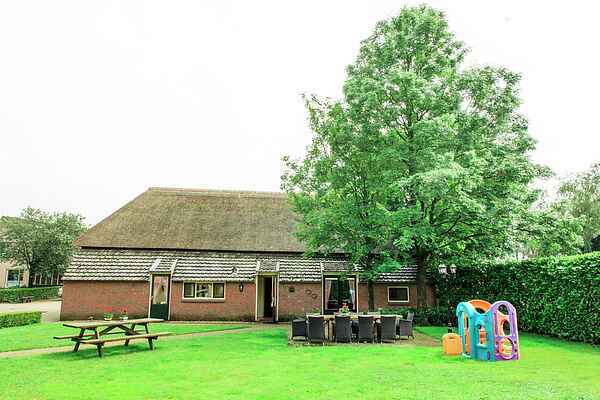 This renovated 18th century farm is located in outside of Moergestel in Brabant. The shutters and partially thatched roof reinforce the farm atmosphere. The spacious garden with picnic table, play equipment and the covered terrace offer activies outside of the house as well. This holiday home is located on the edge of the village centre on a tree nursery. The centre of Moergestel is only 1 km away and the pleasant village Oisterwijk is not far from your holiday home either. The region is perfect for long walks and cycling trips. The Oisterwijkse woods are only a stone's throw away from your holiday home. This location is also a good starting point for day trips to attraction park de Efteling and Safari park Beekse Bergen.